2018 Topps WWE Women’s Division is just for the ladies of wrestling. 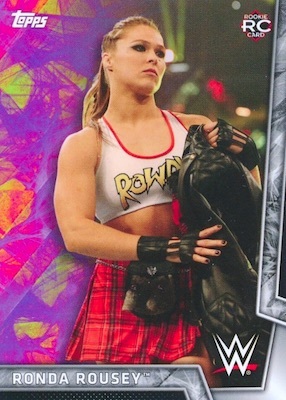 Ronda Rousey headlines the release with her earliest pack-pulled WWE rookie card. While the first WWE Women's Division set released in 2017, that was a retail-only set. The 2018 product gets the full Hobby treatment, promising one autograph and one additional hit in every box. Collectors can uncover the Ronda Rousey rookie card in the 100-card base set that features roster cards and key Matches & Moments. The set also has Hobby-only Blue parallels. Several inserts are part of the 2018 Topps WWE Women’s Division checklist, as well, including Women's Royal Rumble and Hobby-exclusive Mixed Match Challenge. Hits in 2018 Topps WWE Women’s Division are of the standard wrestling variety. That means a base Autographs set, which adds Blue parallels in Hobby, plus Kiss Cards, Mat Relics, and Shirt Relics, which have limited autographed versions. There are also Commemorative Championship Relic cards. Buy 2018 WWE Women's Divison Blaster boxes direct from Topps for $20. PARALLEL CARDS: Silver #/50, Blue #/25 (Hobby), Gold #/10, Red 1/1. Shop 2018 Topps WWE Women's Division autographs on eBay. PARALLEL CARDS: Green #/150, Purple #/99, Bronze #/75, Silver #/50, Blue #/25 (Hobby), Gold #/10, Black #/5, Red 1/1, Printing Plates 1/1. PARALLEL CARDS: Gold #/25, Red 1/1. PARALLEL CARDS: Green #/150, Purple #/99, Bronze #/75, Silver #/50, Blue #/25, Gold #/10, Black #/5, Red 1/1. PARALLEL CARDS: Purple #/99, Silver #/50, Blue #/25, Gold #/10, Black #/5, Red 1/1. MM-15 "Team Little Big" Defeat "The Gingersnaps"
MM-16 "Glowish" Defeat "Team RoseGold"
MM-19 "Team Awe-ska" Defeat "The Boss Club"
MM-20 "Team Little Big" Defeat "Glowish"
MM-21 "The Robe Warriors" Defeat "Ravishing Rusev Day!" MM-22 "Team Awe-ska" Defeat "Team Little Big"
MM-23 Bobby Roode & Becky Lynch Defeat "The Boss Club"
PARALLEL CARDS: Silver #/50, Blue #/25, Gold #/10, Red 1/1. The Blasters have 10 packs per box (+1 bonus pack) with 7 cards per pack. Love this product! The Power Couples insert set is a Target blaster exclusive, while the Women’s Champion set is only at Walmart. I pulled an Alexa Bliss autograph from my first box (I’ve purchased 7 so far), plus autographs of Liv Morgan, Bianca Belair, and a redemption for Nikki Bella (all of which have been #’d to 199 or less). A couple of the pictures used are a little strange, but the overall value and quality of the set is nice. I definitely recommend picking up a box or two (or 7) if you find them in stores.